A University of Arkansas entrepreneurship team focused on transforming bladder cancer therapy won the grand prize at one of the premier graduate student business plan competitions. 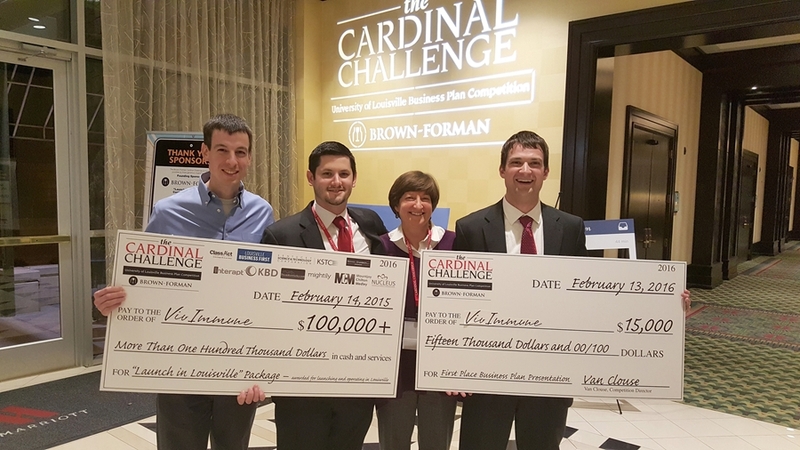 The VivImmune team took the top honor on Feb. 13 at the Brown-Forman Cardinal Challenge, a business plan competition at the University of Louisville. VivImmune won $15,000 in cash plus $100,000 in in-kind prizes if it relocates to Louisville. The team is made up of Corey Coston, a graduate student in the Sam M. Walton College of Business; Andrew McKinnon, an executive M.B.A. student in Walton College; and Sean Smith, a doctoral student in biomedical engineering in the College of Engineering at the U of A. The team's biotechnology company is focused on transforming bladder cancer therapy by way of a new class of cancer treatments called immunotherapies. David Zaharoff, associate professor of biomedical engineering at the U of A, is the primary inventor of the technology, which was co-invented by Smith and Bhanu Koppolu, a postdoctoral research associate in biomedical engineering at the U of A and a recipient of a graduate certificate in entrepreneurship from the university in 2011. "The team was able to answer incredibly challenging questions from the judges, most of whom are health care venture capitalists," said faculty adviser Carol Reeves, management professor and U of A associate vice provost for entrepreneurship. Georgia Tech took second place in the Cardinal Challenge, Purdue was third and Rice was fourth. The Cardinal Challenge offers students an opportunity to present innovative business plans to potential investors, while providing investors with an advance look at up-and-coming entrepreneurs and new ventures.